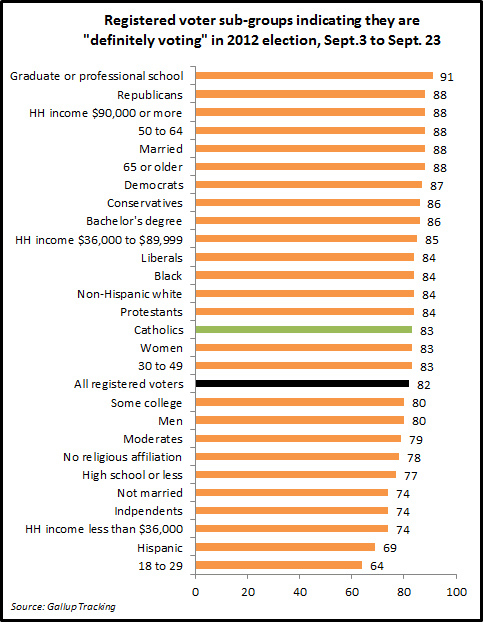 New polling numbers from Gallup are out today on the Catholic vote and other sub-groups of the electorate. 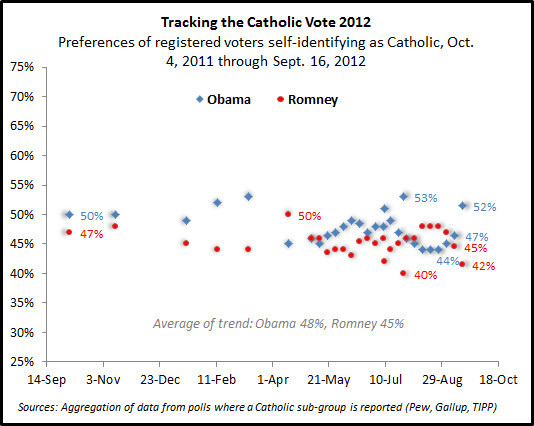 Among those Catholics who are registered to vote, President Obama leads Gov. Romney 50% to 44%. As noted in my previous post, these numbers are likely to continue to tighten next week moving parallel to the national trend (...Updated numbers here). Gov. 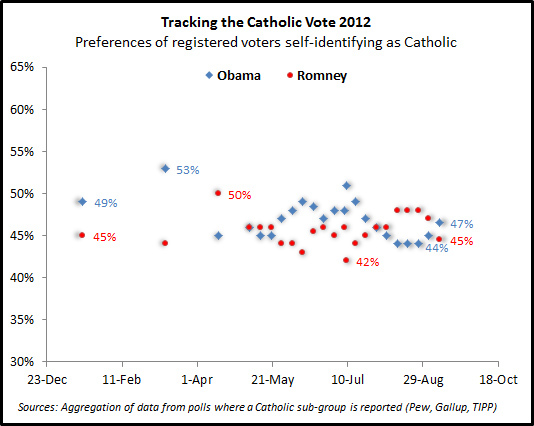 Romney has a 10 point advantage among Protestant registered voters (52% to 42%). The president has an enormous advantage of +45 percentage points among voters of no religious affiliation (68% to 23%). There are also updated numbers on anticipated turnout among sub-groups of registered voters out (i.e., those indicating they will "definitely vote"). Currently, 83% of registered Catholics indicate this, which is similar to the estimated turnout of the electorate overall (...the figure excludes those who are not registered to vote). Several of the sub-groups inched up in voting anticipation this week over last. In other religion-related election news... Sen. Harry Reid has been serving in the role traditionally reserved for the vice president as the lead "attacker" for the incumbent president. This is not often considered the work of the Senate majority leader. It began weeks ago with his claims that Gov. Romney had paid no income taxes in the last decade. Although many objective sources doubted that this was even possible, Sen. Reid stood by information he says he received from an unnamed source. Today, Sen. Reid shifted his criticisms beyond Gov. Romney's tax returns to his role in his religion (...as Mormon's have been polling strongly in favor of the Republican candidate). I think the president's campaign might have been hoping that the public and media might "connect the dots" and realize that some of the campaign's most serious criticisms and accusations were coming from someone within Romney's church (...however many don't know Romney's religion and I assume even fewer are aware of Reid's). Sen. Reid's criticisms have been politically effective especially in light of Gov. Romney's "47 percent" remarks. Yet, regardless of the religious connection these have also made the majority leader look at a minimum a bit unstable and at the most dishonest. Of course Gov. Romney could simply offer to produce as many tax returns as Sen. Reid can produce Senate budgets. I'd like to see Gov. Romney's tax returns (...rather than accountant summaries). However, as a political scientist concerned about the operation of government and mounting debt levels I'd like it even more if Sen. Reid did more to produce a budget. Columbus Day is just around the corner (...and depending on what state you live in you may have the day off work or school). Although Christopher Columbus was Catholic there is still some debate about his nationality that we've noted before. Do Catholics in the United States today view Columbus differently from those of other religions? Yes. As shown below, only 13% of Catholics feel that he should not be given credit for discovering the Americas. Those who are not Catholic have more doubts. Moving down the calendar... If you've been shopping lately you've likely noticed the Halloween candy, decorations, pumpkins, and costumes beginning to take prominent places around stores (depending on where you shop Christmas lights may already be for sale on the next aisle over). All Hallow's Eve is deeply embedded in Church history as the "Night Before All Saints' Day." Are Catholics more likely than others to celebrate it? Perhaps not. 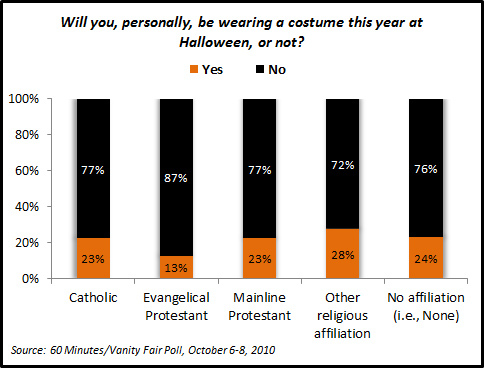 As shown below, only about one in four Catholic adults wear costumes. This is similar to those of other affiliations with the exception of Evangelical Protestants who are less enthusiastic about the holiday (only 13% plan on dressing up themselves). But wearing a costume as an adult could be considered kind of odd to some. Perhaps a better question is directed at parents and whether they plan to let their children trick-or-treat. Expect many of the kids coming to your door looking for candy to be either Catholic or of no religious affiliation. Evangelical Protestant and non-Christian parents don't show the same enthusiasm for the holiday. 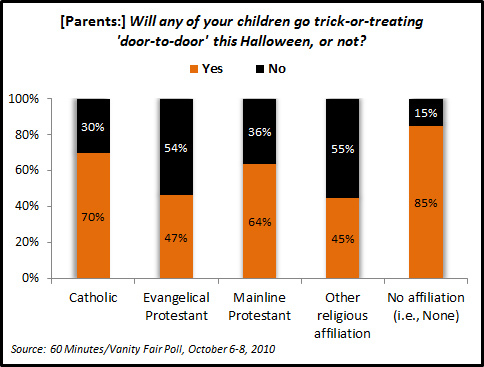 Mainline Protestant parents trail Catholics slightly in their plans of letting their children trick-or-treat. 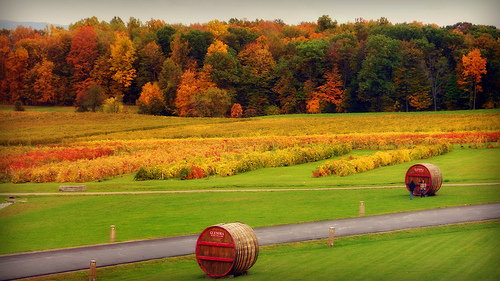 Stay tuned for another "seasonal" update around Thanksgiving, much more election analysis in-between, and the release of some major new CARA research studies. Photo above courtesy of blmiers2 from Flickr Commons. With the nominating conventions over there is new data to analyze. The Clint Eastwood speech at the Republican Convention was probably one of the oddest things I’ve seen. Yet, I am equally struck by the awkward floor vote at the Democratic Convention to reinsert the word “God” into the platform after what appeared to be sufficient delegate opposition to block this change. In recent elections the Democratic Party has become increasingly dependent on the votes of the religiously unaffiliated. It appears that some in that party may be making the same mistake reporters often fall into by assuming that the religiously unaffiliated (i.e. “Nones”) are mostly people who do not believe in God or who are not religious in any way. This is not the case and the religiously unaffiliated are sub-group with diverse religious beliefs and practices. Those who don’t believe in God make up a small percentage of the U.S. adult population. 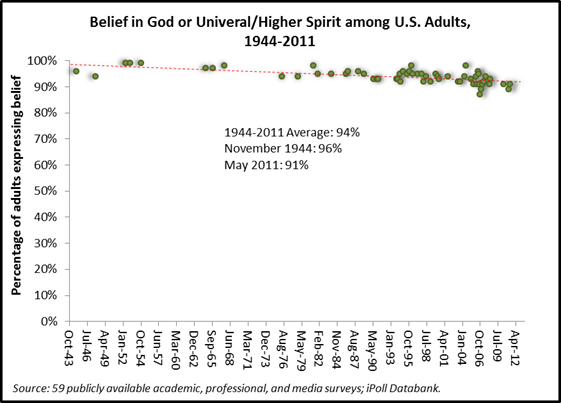 As shown below, in 59 national polls since 1944, the percentage of Americans who said they believed in God in 2011 was only 5 percentage points different from what it was in 1944. If current trends continue, we might expect to see a majority of Americans not believing in God around the year 2560 (…and I still wouldn’t bet on that as American religiosity historically has ebbed and flowed with religious revivals and declines). At best one could say the Democratic Party delegates were perhaps more than 500 years out in front of the prevailing trend? 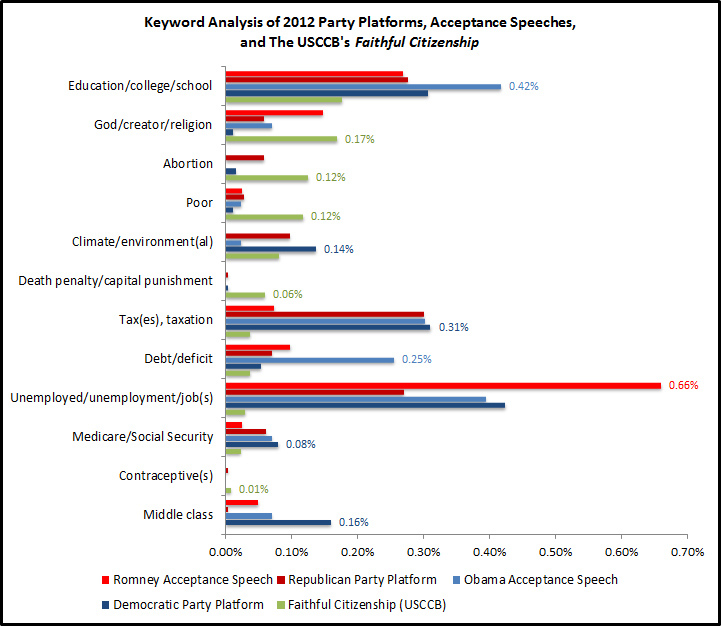 Analyzing the nomination acceptance speeches of both candidates and the party platforms reveals some interesting similarities and differences. For example, both platforms were written at the level of a college sophomore’s reading comprehension. Both candidates’ speeches were written at the 7th grade level. This is typical as spoken word text always grades out lower than text meant to be read. The media has given a lot of attention to the use of the word “God” in the platforms. I thought it might be interesting to add a few more words into the discussion and also include the Catholic Church’s “platform” document, Faithful Citizenship. The figure below provides the total mentions of each word or phrase shown as a percentage of all words in each document or speech. As one might expect Faithful Citizenship has the strongest focus on God, a creator, or religion followed by Gov. Romney’s acceptance speech (…God has been disappearing from American print in general for many years now). The Church also places a greater emphasis than the parties or candidates on abortion, the poor, the death penalty or capital punishment, and contraceptives. President Obama’s speech referenced education, college, and schooling more than other sources. He also noted debt and the deficit more. The Democratic Party platform leads in references to taxes or taxation (by a thin margin), the middle class, and the environment or climate. Gov. Romney’s acceptance speech focused strongly on unemployment and jobs. Cardinal Dolan gave a benediction at both conventions. Quite an interesting pattern emerged in the media’s response to this. Fox News carried the prayers live. CNN let the audio of the prayers run in the background audio while its commentators discussed the nominee’s speeches. MSNBC did not use any audio or video of Cardinal Dolan. 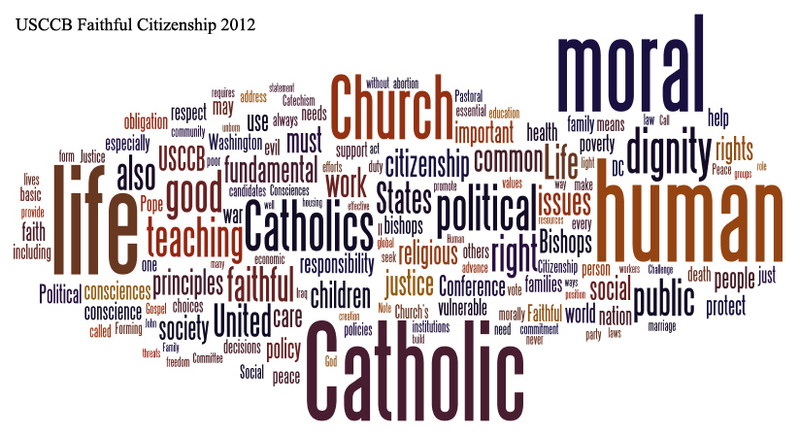 I think the fact that Cardinal Dolan spoke at both conventions reflects the non-partisan tone of Faithful Citizenship. At the same time some in the media appear to be adopting more partisan voices. In the past decade, these cable news channels have drifted away from even the appearance of objectivity (...not too long ago this was a prized value of good journalism) and now seem to gravitate overtly to party-based ideological positions. Fox News is clearly supportive of the Republican Party and MSNBC is clearly supportive of the Democratic Party. CNN which has historically tilted left, while still trying to maintain an outward appearance of objectivity, may be attempting to move to a center position (e.g., a CNN commentator responded to the delegates’ response to the vote for putting “God” back in the platform as “beyond awkward, embarrassing, it’s stupid”). What effect has this evolving media environment had? Fox News had great ratings during the Republican Convention and MSNBC led in the ratings during the Democratic Convention. 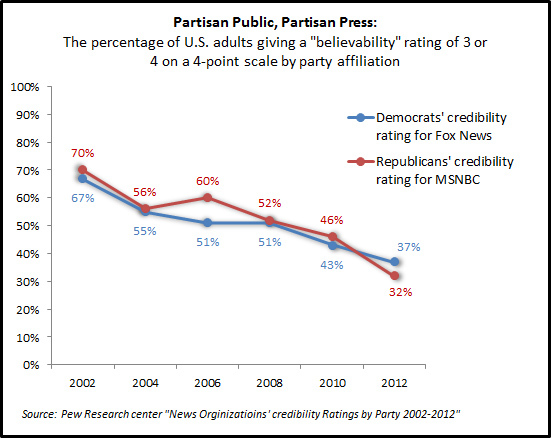 At the same time, many members of both parties no longer find the “opposing” news media channel believable! Successful cable news has essentially sold out objectivity for ratings. I think Gov. Romney could have read the phone book and Fox News commentators would have found his speech appealing. President Obama could have done the same and Chris Matthews would likely have called it a home run and felt a new thrill in his leg. I am troubled by a media landscape with two large groups of Americans (i.e., those paying attention), each tuning into news channels to hear what they want to hear—a story crafted just for them—rather than the news. This only reinforces popular pressures that have been preventing Democrats and Republicans from working together in government. Studies have also shown that Fox News and MSNBC viewers are among the least informed (...should anyone be surprised given that they are only hearing half the news?). Arguably the only positive effect of this new partisan media may be in its capacity to keep the stove hot for the “opposition” party. Thus, when President George W. Bush was in office, MSNBC was leading the way in criticizing and noting the president’s shortcomings—sometimes fairly and sometimes not. But they kept the cynicism and the pressure on. Now I see Fox News doing the same—sometimes fairly and sometimes not. An unfortunate side effect of this new type of news channel is that the network closer to the party in power (currently MSNBC) often looks a bit foolish playing the role of cheerleader for the incumbent and ignoring their faults when these are in plain view of the public. President Obama’s campaigns have spent an exceptional amount of money on polling, focus groups, and voter research (…and I’m not alone in noting this). In the modern campaign these are used to test messages and language which gets refashioned into talking points. Polling is important to the 21st century Democratic Party as its support is based primarily on identity politics. It generally attempts to build a coalition of sub-groups in the electorate and needs polling to do this well. The party tends to craft its messages and policies to meet the collective preferences of this coalition. A big part of the party’s policies are reflective of patronage to these groups. Regardless of his personal preferences, when President Obama shifts on an issue it is likely more often than not in response to or supported by polling data. I've noted that I think if the president’s decision on the contraceptive mandate was likely based on survey data. If it were more about health policy than identity politics, the first class of drugs to be subsidized without need for a co-pay would likely have been blood pressure and cholesterol drugs to combat heart disease, the number one killer of Americans and of American women (e.g., drug subsidies in Australia). Another example of the Democratic Party’s use of identity politics and polling is its growing focus on environmental issues in the last dozen years. Policies like cap-and-trade test well among college educated voters. This segment’s enthusiasm for social justice began to wane in the late 1990s and the Democratic Party steered toward environmental justice appeals that fared better with this important voter sub-group. Yet, these environmental initiatives would likely have a negative impact on the poor. Collectively they would amount to an indirect regressive tax (the wealthy can afford bigger energy bills without going broke, many in the working class cannot). These policies would also create an inflationary ripple effect throughout the economy and slow economic growth. Will they help the environment? It’s questionable. Climate change is a classic collective action problem and if China, India, and other developing countries decide not to go along with the advanced industrial and post-industrial countries in curbing carbon emissions the impact would be modest at best (...and climate knows no borders). In essence it would be weak medicine with strongly negative side effects borne disproportionately by the poor and working class. Republicans structure their politics in a different fashion. Since the days of Milton Friedman and Ronald Reagan, appeals of the Party have been rigidly based in ideology (e.g., market forces, deregulation, tax cuts, reducing government spending, supporting a basket of socially conservative issues). Thus, generally you see Republican campaigns using significantly less polling than Democrats in campaign finance reports over the years and in return often get criticized for “not having new ideas” or being “out of touch.” They don’t often test their messages—they try to sell their ideology as best they can to the widest audience possible. This creates a dynamic where changing policies is treated as heresy and can result in a member being marginalized or expelled (e.g. the effects of Grover Norquist’s the tax pledge). When it comes to taxes this has created a dysfunctional one-way ratchet where even a temporary tax cut to create economic growth cannot be left to expire without being considered a violation of the Party’s ideology. At the same time, Republicans will quickly jettison aspects of its ideology when these are co-opted by the Democrats. For example, the Affordable Care Act is partially based on a Heritage Foundation health care model (i.e., “Assuring Affordable Health Care for All Americans” by Stuart M. Butler, 1989. The author of this paper now notes “I've altered my views”) that is similar to the system eventually created by Gov. Romney in Massachusetts. Even cap-and-trade has some conservative roots. These two very different party structures and approaches are evident in the parties’ platforms, speeches, and eventually their policies. I think it has led the Republicans to present a rather confusing agenda of creating jobs and reigning in debt and the deficit while not recognizing that the debt cannot be tackled without increasing revenue and that cutting spending will lead to a loss of jobs and higher unemployment in the short-term. It also leads them to propose rigid balanced budget requirements that would essentially cripple the country in a time of economic crisis, disaster, or war (...often this is sold in reference to the average American family balancing their budgets at the kitchen table. That is a powerful image but incorrect. Most Americans don’t have to balance their budget and take on debt for most of their life to finance the costs of owning a home, automobiles, educational loans and in the short term many use credit cards, equity loans, or title loans that allow them to “live beyond their means”). In my opinion, both of these strategies in competition with each other do not work well in terms of policy making for the country (disclaimer: I have no party affiliation). Republicans will not raise taxes because of their strict reliance on ideology and Democrats resist spending cuts because of their need to support programs important to their coalition. The two major parties in America are playing a game of chicken and this election will unlikely end it. I don’t know of any political scientist who is predicting one of these two parties will be able to control the executive and legislative branches in January 2013. They will have to work together to get anything done and I don’t know how this will be possible (…and eventually the credit rating agencies will act again). I think this is why whoever wins the presidency will be headed for disappointment. 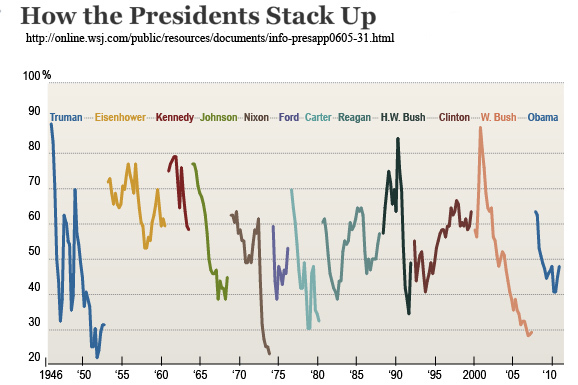 As shown below, only one president since the end of World War II has left office being more popular than when he entered (the graph shows percentage approval). President Clinton did so, in-part by initially winning a 3-candidate race with a plurality of support in 1992. Americans expect their presidents to keep promises and solve problems. You might even say they expect them to be “wizards.” As President George W. Bush once said, “if I had a magic wand, I would wave it.” This is often cited as an amusing “Bushism” but among political scientists and economists who read an allegory into The Wizard of Oz it can also have a deeper meaning. 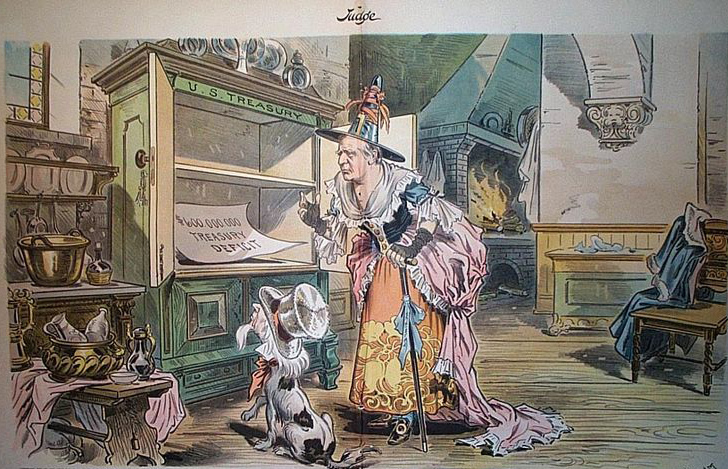 In that children’s story some see metaphors about the U.S. presidency and monetary policy: yellow bricks and OZ (the gold standard), magical ruby slippers (silver in the book), and a wizard who seems all powerful but in the end is just a man behind a curtain who can only offer symbolic gifts for the things that people really desire. You can see a picture of President McKinley—a possible inspiration for the Wizard—from Judge, a weekly magazine of the time. 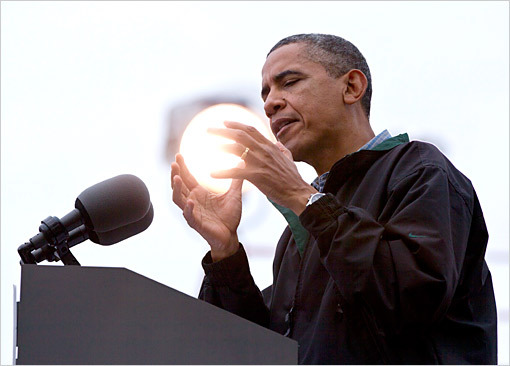 Does he need magic to get re-elected? No president since Franklin Delano Roosevelt has won as an incumbent with the economic results of the Obama administration (i.e., an unemployment rate above 8 percent). I think this is why we heard about FDR and Lincoln in his acceptance speech as both similarly served during a period of a great crisis that was not of their own making. Despite election forecasting models of the past predicting a poor outlook for the incumbent, the president leads in many aggregate polling averages, Electoral College scenarios, and election market predictions. In my opinion, especially after the modest goals outlined in his acceptance speech, President Obama has acknowledged that most Americans know he’s no wizard. He hangs on to a lead because Gov. Romney has so far failed to convince enough of the electorate that he has the magic set of policies that can bring the country out of its anemic recovery. America may not be losing much of its belief in God but many may now realize no one they elect is a problem solving wizard. President Obama’s greatest asset is that he is well liked personally by many Americans. If re-elected, and history repeats itself again, odds are he will be less well liked in 2016. The president’s strong support among those without a religious affiliation (i.e., Nones) is at the level he would need for re-election (73% to 17%) given his lack of support among Protestants (36% to 55%). 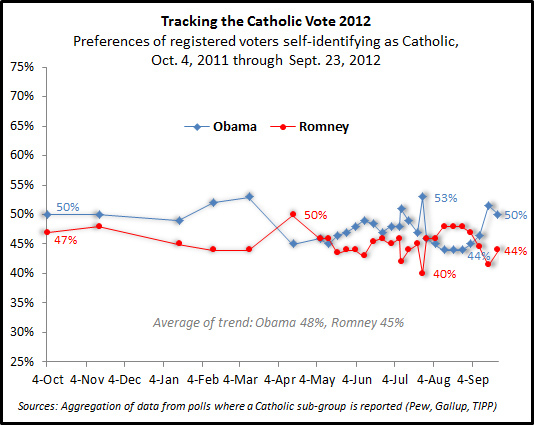 As is often the case, the Catholic numbers mirror the population overall with a 46% to 44% edge for President Obama. Although the president leads among female registered voters overall (51% to 40%), he is trailing a bit among married women (45% to 50%). The president’s lead in this sub-group overall is rooted in support from unmarried females (57% to 30%). The president is having less success holding on to his voters from 2008 with 82% of these individuals expressing support for him in 2012. Gov. Romney is holding on to 90% of Sen. McCain voters. The president maintains strong leads among young adults ages 18 to 44 (49% to 39%), minorities (80% to 12%), urban residents (61% compared to 29%), and those living in the Northeast (53% to 35%). It is still too early to put too much weight into polls as a predictor of eventual outcomes. The debates, upcoming economic reports, a continued onslaught of media ads and get out the vote efforts remain ahead. If past campaigns are any indicator there will also be talk of possible October surprises coming soon. With the party conventions over it still looks too close to call. The vote of American Catholics remains split.